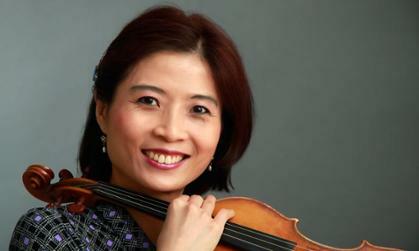 Wanchi, born in Taiwan, started playing violin at age six and came to the U.S. at age 13 to study at the Peabody Conservatory and the Baltimore School for the Arts, soloing with the Baltimore Symphony Orchestra under conductor Catherine Comet a year later. She went on to earn a Bachelor of Music from the Curtis Institute of Music, a Master of Music from The Julliard School, and a Doctor of Music from Indiana University. She has given highly acclaimed recitals and collaborated with internationally renowned performing artists in chamber music performances throughout the United States, including at the Kennedy Center. She has served as an adjudicator at the Hong Kong Music School Festival multiple times and as a performing instructor at the Bay View Music Festival in Michigan for the past five summers. She has presented at the ASTA National Conference on multiple occasions and her CDs of Eugène Ysaÿe Sonatas and complete Partitas and Sonatas of J.S. Bach for Solo Violin are being released in the fall of 2013 and 2015, under the Centaur Records label. Both CDs have earned very favorable reviews. A founding member of the Trio Sorpresa, a piano trio newly formed in 2014, Wanchi is looking forward to their scheduled concert tours in the near future. She currently resides in Harrisonburg, Virginia, where she teaches a full violin studio at the James Madison University School of Music.